Myddfai is a tranquil, peaceful haven, surrounded by the beauty of the Brecon Beacons. Myddfai is renowned for the history and heritage of “The Physicians’ of Myddfai’ who were a lineage of herbalists and medical practitioners stretching back to medieval times.The last of whom is buried in the Myddfai St Michaels Church. You can visit our website to discover more about Myddfai at www.myddfai.org. The Centre was officially opened by Their Royal Highnesses The Prince of Wales and The Duchess of Cornwall on 30th June 2011. The hall rebuild was followed by the BBC and shown on BBC 1 in August 2011 as part of the Village SOS series. The majority of the funding for the re-build came from the Big Lottery Fund. 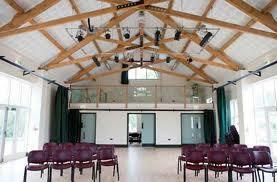 Hall hire charges range from £8.40/hr for regular classes or groups to £20/hr for corporate and non local hire. Maximum capacity is 200 seated theatre style or 120 seated at tables. We are open on Bank Holidays except the Christmas & New Year ones The hall is available for hire 7 days a week from 8am-12 midnight. 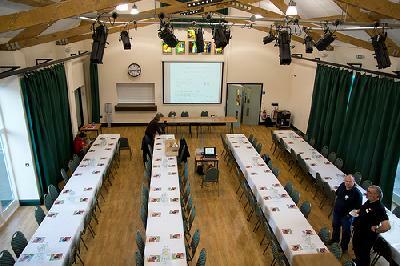 The large auditorium is designed for use by the community as well as being a perfect venue for conferences, seminars and wedding receptions, where catering can be arranged. It can be hired by clubs, societies and charities for regular events and programmes. Facilities include state of the art lighting and sound equipment, WiFi, projection facilities, black-out curtains and moveable stage, making it ideal as a setting for high quality performances. Available seven days a week. 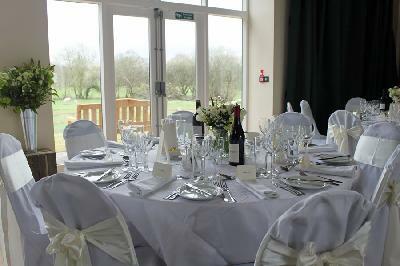 We also have a fully equipped kitchen, with enough cutlery & crockery for over 120 guests. We also have a well stocked quality gift shop, with many unique hand crafted local items on sale, plus we have an emergency food cupboard. There is a lovely café in the Centre too with homemade lunches and cakes. Both the café and the shop are manned by our cheery band of local volunteers. From Llandeilo direction: leave the A40 at Llangadog, follow the road to the left at the Llangadog shop, then take the first right, signposted Myddfai. Follow this road for approx 5 miles. As you come down into the village of Myddfai the Myddfai Community Hall & Visitor Centre is on the right.